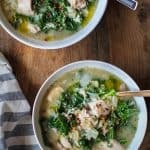 Hearty and healthy crock pot chicken, artichoke, and kale soup – a simple recipe that requires few ingredients and is made easily in your slow cooker! Ahhhhknow. It’s still summer, it’s still hot, we’re still relishing room-temperature food, but I couldn’t help but share this bowl of comforting cold-busting bliss. I mentioned in my last post that amidst travelling last week, I procured some gnarly sinusy face and chest gunk, which has made me fairly disinterested in food that requires any sort of effort to consume. Enter: Disslurpysoup. This recipe was inspired by a trip to the prepared food section of Whole Foods a couple of months ago, when I was too lazy to cook. I spotted their Chicken and Artichoke Soup, gave it a whirl, then decided to reverse engineer it and make it my own. 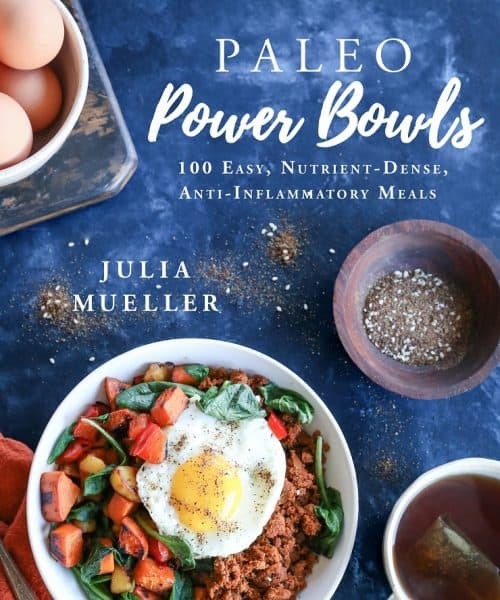 It truly is the perfect comforting meal – great for any time of year (provided you’re cool with sweating while eating during the heat of summer), any occasion, and particularly marvelous for those days you feel under-the-weather and just need a thick blanket, some couch time, and perhaps some Netflix + chill. Let’s talk chicken. I sauteed an onion and pan-seared bone-in skin-on chicken thighs for this soup, then added everything to the crock pot and allowed it to slow-cook together. After 5-ish hours, I took the thighs out of the crock pot, removed the skin and bones, chopped the chicken, then added it back to the soup. If this sounds like it’s too much work, no sweat: you can definitely use boneless skinless chicken breasts. I will say, though, that bone-in, skin-on chicken yields a much more flavorful soup. The arborio rice makes this soup super thick and hearty without the need for flour, and also gives it a creamy and comforting essence. 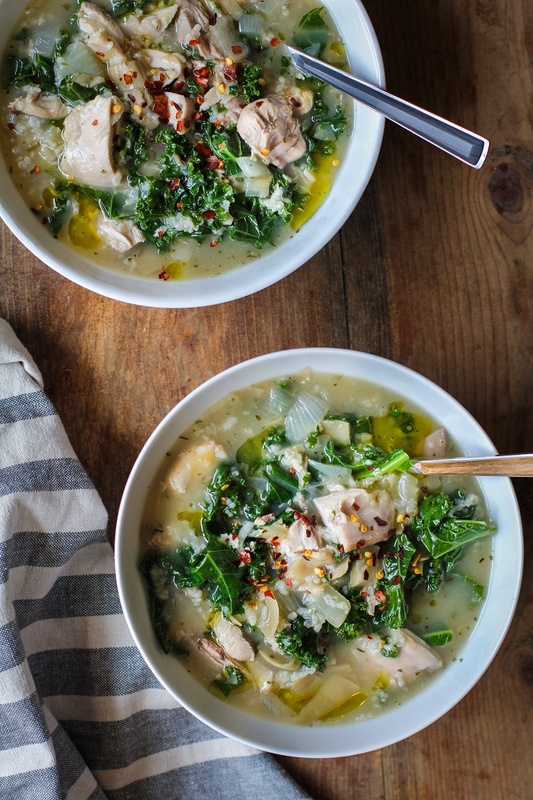 The kale gives it some fresh green power, with a little crisp crunch, which is a nice contrast from the rest of the thick and creamy soup. I like adding red pepper flakes to my chicken soup to help clear the sinuses and also add a little POW flavor to give it that unique je ne sais quios. For serving the soup, I recommend a squeeze of fresh lemon juice, to add some extra tang, but if you’re averse to the lemon-chicken combo, the soup is still delicious without the lemon juice. Use boneless skinless chicken breasts instead of bone-in thighs. If you do this, simply chop the raw chicken into cubes and add it to the crock pot raw – no need to brown the meat first. Substitute chard or spinach for the kale. Any type of rice works for the soup, just bare in mind arborio rice will naturally thicken the soup quite a bit to make it super filling and hearty. Add a tablespoon or two of cider vinegar or lemon juice for some extra tang. Prepare the whole recipe in a stock pot, rather than in a slow cooker. Omit the rice to make this grain-free. And zat iz allllll – all you need is just a few ingredients and a slow cooker for this hearty comforting soup! Suh-luuuurp! Heat the olive oil to medium-high in a cast iron (or regular non-stick) skillet. Add the onion and saute, stirring occasionally, until it begins turning brown, about 8 to 10 minutes. Transfer the sauteed onion to your crock pot. Using the same skillet you used to cook the oven, place the chicken thighs skin-side down on the hot skillet and cook until browned, about 3 to 5 minutes. Flip using tongs and cook an additional 2 to 3 minutes on the other side - don't cook the chicken through. Transfer the chicken thighs to the crock pot along with the remaining ingredients, except for the kale. Cover and turn on the crock pot. Cook for 4 hours on high or 6 hours on low. Remove the chicken thighs from the crock pot using tongs and place on a cutting board. When cool enough to handle, discard the skins and bones and chop the meat. Place the meat back in the crock pot along with the chopped kale. Stir, cover, and allow soup to sit until kale has wilted, about 10 minutes. Serve heaping bowls with fresh lemon wedges, a drizzle of olive oil, and a sprinkle of red pepper flakes. Yum! 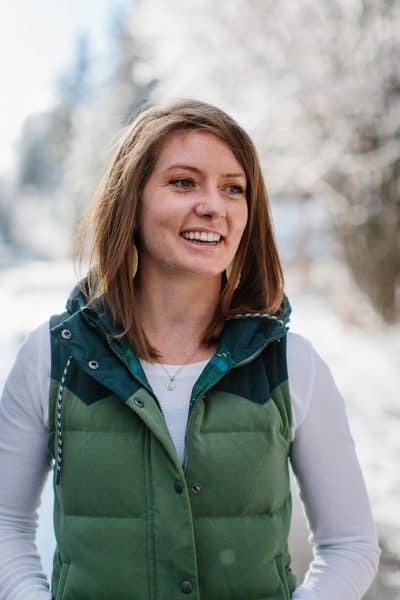 I just got a crockpot and am looking for recipes to play around with. Love the heat and flavors here! Oh yes, yes, yes! You must try this soup in your new crock! Made this soup tonight and it was fabulous! My husband loved it too. Perfect for a beautiful Autumn evening. Thank you so much! This ones a keeper! It doesn’t matter if it’s 100 degrees or 30 degrees, I could eat soup anytime, any season. Although, this has me especially excited for fall! LOAD ME UP A BOWL! Girl, I’ve been in the same boat. We literally ate soup every single day last week. But the evenings have been cool enough here that it was actually nice to have. So I say bring on the soup! You legit had me at crockpot, chicken and artichokes! 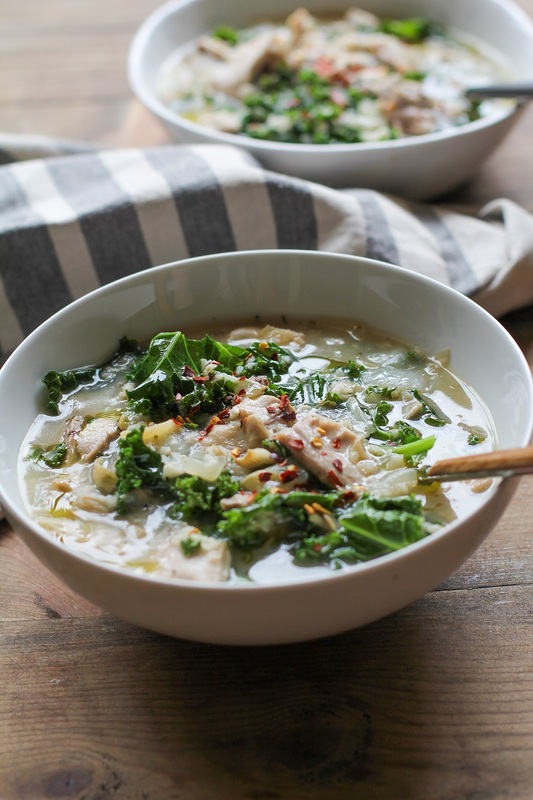 I am still working on TRULY loving kale…but I bet it adds some yummy texture this MIND BLOWINGLY YUM soup. It’s 940293 degrees here and I just wanna be faceplanting into this goodness. That is all. I hear ya…if kale’s not your jam, it’s not your jam. But I bet you’d love the soup without! I don’t think I’ve ever had artichoke in a soup like this! Can’t wait to try it ASAP. I’m so ready for soup season! Yeeees artichoke hearts in soup are soooo good! I’m ready for soup season too! Very nice! I will try that soup during autumn and winter. Merci! How many servings does the recipe make? I have 6 coming for dinner and was wondering if one recipe is enough! Thank you so much! I’m sure we will!